If you can afford a hundred dollar mouse, we highly recommend checking out the Wireless DXT Mouse, the Contour RollerMouse Red, and the Newtral mouse. 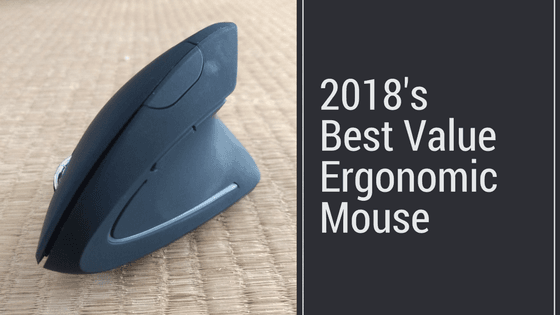 These are our top picks in our comprehensive ergonomic mouse guide. 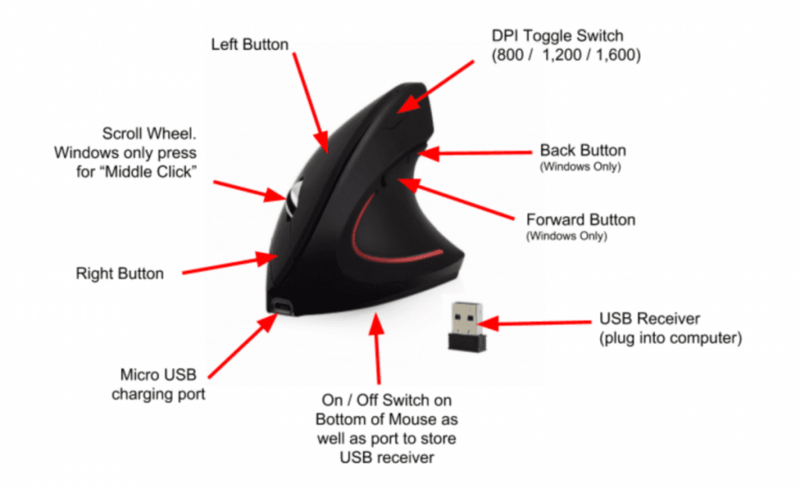 If you want to spend about $20 and still get a really good ergonomic mouse, read on! Ready to get one? Check the latest price for this model. For many people, a vertical mouse can be the best first step towards a more ergonomic mouse. Vertical mice keep your mousing hand in a neutral position, which some call the “handshake” position. This handshake position allows you to loosely grip the mouse and move using your whole arm and not just the small muscles in your wrists and fingers. Moving just the small wrist and hand muscles over and over, all day, in small movements can lead to repetitive stress injuries. 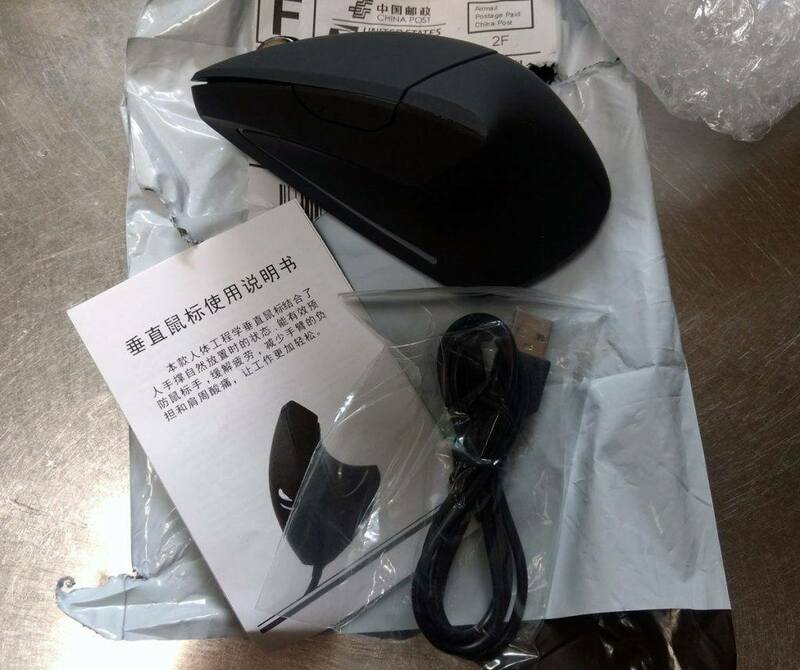 This mouse ships directly from the manufacturer in China, and arrives in a bubble-wrapped package that fits in most mailboxes. We bought seven of them and on average it took about 11 days to get to our U.S. based address. The mouse comes with instructions, USB receiver, and a MicroUSB charging cable. These mice had some funky ePacket tracking number which is like a USPS tracking number that shows the shipping transit information in near real time. It worked for us but beware that we have heard from others that ePacket tracking is sometimes not updated in a timely fashion. This mouse does ship for free to 37 countries which all but four support ePacket tracking. We tested the mouse on multiple Macs, Windows, Chromebooks, and Linux machines. On every single computer tested, the mouse worked with no driver issue or software that needed to be installed or configured. For Windows users, all of the buttons highlighted below worked. For other platforms, the middle click and the back / forward buttons usually don’t work. This is common for most mice with so many buttons. How does this mouse stack up against more expensive models? First, a few of us used this mouse every day for the past six months. We dropped the mouse many times during the normal course of work. We also tossed these mice into bags as we zipped from place to place, and even traveled internationally with the mouse. 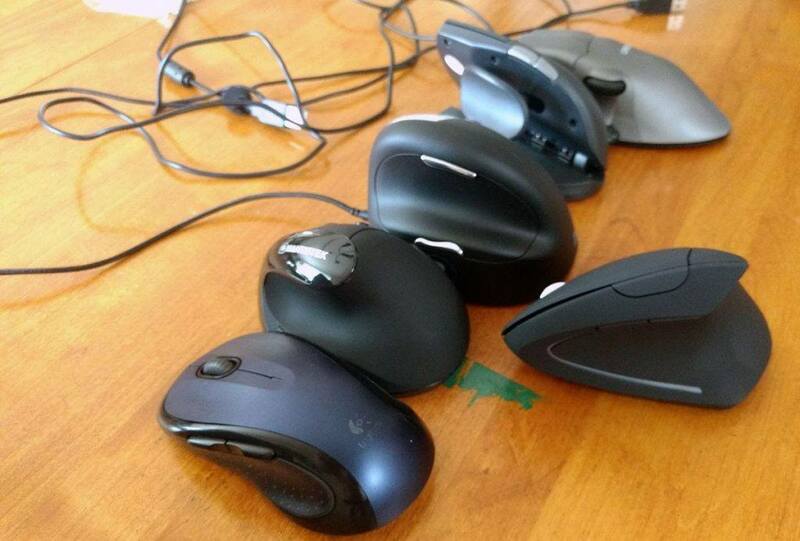 We then brought out some of our favorite mice to compare. We go over more details in our review video above. In a nutshell, this mouse was about as comfortable as other models that cost upwards of five times as much. If costs were not a factor, we would certainly go with a more expensive model like the Contour Unimouse (wish though this model has a spot to store the USB receiver…we broke ours during testing because we just tossed it into our laptop bag!). Compared to more expensive mice, this one does the job with enough ergonomic comfort. Despite having access to any ergonomic mouse in the world, two of our testers are still using this model as their daily mouse. This mouse has a button to switch the DPI on the fly between three different settings! The higher the DPI, the faster your mouse will move on the screen for the same amount of hand movement. For folks with multiple screens, a higher DPI allows you to quickly move between this extended computer screen space. Even if you only have one monitor, multiple DPI settings can be useful. For example, if you are doing fine photo retouching work, you may want to lower the DPI so you have more control. But for everyday tasks, you may want a higher DPI so you can move around more quickly. This mouse has an easy to reach a button that allows you to toggle between 800, 1200, and 1600. We tested this mouse with an external 4K display where the 1600 DPI setting worked like a charm. But even with a 4K monitor, programs like Photoshop offer better control with a mouse set to 800 DPI. You are not going to get a perfect mouse for $20! Here is our complete list of issues we think could use some improvement. The “middle click” on the scroll wheel requires too much force. We also got feedback from another user ab0ut this issue. If you need the middle click, your fingers are going to get a small workout. The USB receiver storage area is too tight. You may need a tool to pry out your USB receiver. Once you get it out, we recommend storing it almost all of the way in. At least you won’t lose it! While the rubbery cover is excellent for handling, it will wear out unevenly. After a year, you will see where you grip the mouse. In some way, this is ergonomic feedback. If the mouse outer covering is wearing out, you can see patterns of where you are applying the most pressure. No user replaceable rechargeable battery…yet! We may get this figured out and share how to change a battery. Awful instructions manual! Fortunately, we rewrote it. Center of gravity too high. You will knock over this mouse many times by just bumping it. It’s a vertical mouse so not much can be done about this design issue. If you don’t have an ergonomic mouse, just get this model and start using one now. It will work on whatever system you have no problems or the need to install any custom software. We tested this mouse against many other models and have concluded this is the best $20 ergonomic mouse we could find. If you can afford a more expensive mouse, without any reservation we recommend getting a brand name model. Not all of us are ready yet to invest $100 or more on a mouse so we think this is an excellent first step towards a more ergonomic mouse. You may even end up just sticking with this type of mouse for the rest of your computer using career. It’s definitely a good enough ergonomic mouse. Since 2011 we sold ergonomic devices online from some of the largest brands on the market. Back then, there were few online retail options for good ergonomic devices. We’ve stopped selling brand names online directly because now you can easily get these devices from sites like Amazon. We are now going to focus on finding lesser-known ergonomic devices and try to find the best deals for affordable models. We won’t have many models but you can bet we’ll have devices we like at prices we all can afford. These mice also make a really good gift. Chances are, the person receiving your gift does not have an ergonomic mouse and this is a great way to introduce that person to healthier options…especially for folks that work with computers. Thanks for supporting ergonomics!